Just as we enjoy decorating Darlington House with vintage ornaments and decorations at Christmastime, so we collect vintage decorations to display at other holidays, too, including Easter. I first started collecting these little toy lambs and sheep shortly after we bought Darlington, in the late 1990s. I believe they were made in Germany in the first decades of the twentieth century. I've seen them sold in their original boxed sets, sometimes accompanied by a shepherd, but I've bought mine in singles and pairs. I've found them in group shops and at antiques shows. They are quite small, with the littlest ones standing no more than an inch tall, and the largest one I have around four inches tall. 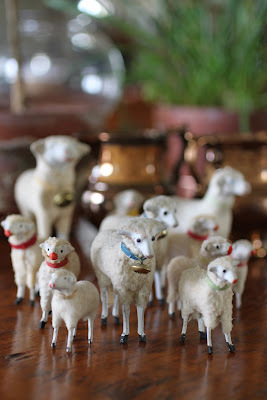 I like to put these lambs and sheep out at Easter, in a flock, as I have them displayed here in this photograph. I think they are quite charming, and I am really rather fond of them. Tell me, what do you collect and display in your house at Easter? Those are indeed charming, much more so than the usual cloying duck-and-bunny easter fare. Your Easter lamb parade is delightful. It reminds me of the home of an acquaintance. Because his last name is Shepherd, he started collecting Victorian lithographs of sheep flocks, and apparently there were many. Now he has a wall of flocks. The sheep are very sweet. I put up an egg tree. The eggs are blown and then painted by me and whoever happens to be with me at Easter.The oldest egg is 26 years old. I have eggs painted by two exchange students, a former husband, a former boyfriend, my kids and their friends.Some of the artists were less interested in painting the eggs than others. The techniques vary from using hodge podge to apply motives to using a glue gun to apply beads from when my daughter was little. Now that I live so far north, unfortunately the branches are bare, but the eggs use to adorn cherry branches. That looked quite pretty! These are just darling - I love them!! What a welcome change from all the overly pastel Easter decor!! Wishing you a wonderful holiday! These are wonderful, Reggie, and truly better suited to the holiday than rabbits! I hope you and Boy have a lovely Easter. They are so lovely. What are they made of? MDR: Put another way, your friend's walls are flocked with flocks! Janfaw: Easter trees can be marvelous! How nice to have one decorated with eggs decorated by people who are (or once were) special to you. Dandy: Their bodies are made of carved wood, with their faces gessoed and painted. The wool appears to be a nappy felt. They have silk ribbons around their necks, with some sporting diminutive bells hanging from them. How charming are your flock of lambs on parade. Sadly, our renovation continues so putting any sort of collection out, only gathers a fine layer of dust. I love clever collections artfully displayed during any season. I have a tiny ring dish with a bunny that my daughter gave to me that I adore. My mother was of Ukrainian origin, so I have her collection of Pysanka made by the women in her church in the immediate post WWII years. I display them in a purple glass basket. I also love the idea of an Easter tree. In earlier years, I would decorate hard-boiled eggs with a wax crayon and then color them with specially mixed dyes. Guests would take them home to become a snack or an egg salad sandwich. they really are charming! for the Clarks, it's just some alabaster eggs and two small stained glass pieces my late father in law made for me. I have a zillion 19th/early 20th century lead toy soldiers that billet my digs year around. I surround a floral Tiffany bunny with a variety from my collection of Limoges hand painted egg boxes as a centerpiece and further Limoges eggs scattered amongst fresh floral mini vases on our Easter table. PVE: I am sure that you will be decorated to the nines, once your reno is (finally) completed. DocP: What a treasure you have! TDC: That is a thoughtful gift, indeed. Stephanie: We had some alabaster eggs growing up, which I believe one of my lucky sisters now have. They were quite pretty, I recall. ADG: Reggie is aware of your collection, which brings out a small green-eyed monster in him, he admits, whenever he sees it shown on your most-delightful blog, or when he thinks of it. I had a very small collection of such soldiers, bought at Sullivan's Toy Store, which I ruined as a laddie through heavy play and amateurish re-painting in inappropriate colors. I also had quite a few fox-hunting and farm figures made by Britain's Limited, but I haven't a clue what ever became of any of them. Anon 12:05: It must be lovely, indeed! These are absolutely delightful and are such an attractive and unusual decorative feature for Easter. Although, as you say, you believe them to be German, we have never been aware of having seen anything like them before and to have a flock is, indeed, very special. 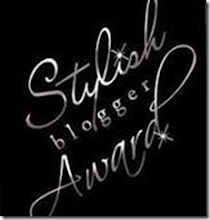 We are so pleased to have discovered your most interesting and eclectic blog through the comment you left on ours. We have signed up as Followers and very much look forward to your future posts. Do you have a black sheep? You must find one, as every flock needs one! I'm filling the house with white and pink flowers. As Cottagey and frilly as I can manage. And I'm making a pink cake today, with pink frosting! Thank you for the loan of the Staffordshire page of designs, its on my blog and is a delightful addition. At Easter I display discarded birds' nests. One of them, a wren's nest, has been lined with strands of my hair! Your little flock is perfectly charming! Wishing you all a very blessed Easter!!! I love your collection, it speaks of a certain gentleness. Oh dear I suppose I am rather dull, I have no collection outside of my library. Biographies and autobiographies ... England and France and American expats ... 1880ish - 1950ish. A small cosy library. Art, yes we collect a bit of that. I really love coming here! It is always such fun. "They are quite small, with the littlest ones standing no more than an inch tall..."
Reggie, you have helped revive my interest in collecting pairs of antique carved animals for a Noah's Ark shelf in my library. I've collected more photos of others' Noah's Ark collections than figures. As with everything else requiring discipline and focus, getting started is the tough part. Believe it or not, I have a similar collection! I love these! Easter decorations in general can be pretty awful and I struggle with what to do at my house and usually just opt for alabaster eggs and a bunny or two. A tiny antique pewter one is my favorite...you would approve!